After the world’s thinnest tourbillon model launched in 2014, Bulgari now launches the Octo Finissimo Minute Repeater, which earns the title of the smallest on the market. 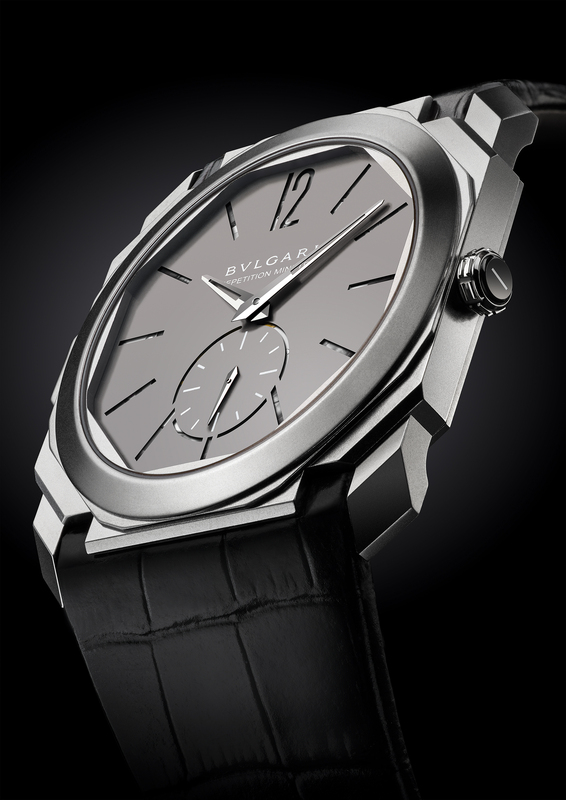 Bulgari is taking a new step in this field, once again pushing the limits. The Octo ist not just any watch. Already an iconic model, it reinvents itself in 2016 with a new collection.. The Octo Finissimo Minute Repeater lays the foundations of a new approach to mechanics and to classic complications while extending Bulgari’s line of ultra-thin watches. With this timepiece the watch manufacturer also preserves its status and cultivates watchmaking traditions by combining extreme slenderness with one of the most elaborate horological complications. A striking watch implies a number of specific construction constraints and full command of certain distinctive skills in order to achieve the best possible outcome: an intense, crystal-clear chime with a perfectly uniform and regular cadence when the mechanism is activated. The aim was to achieve the perfect sound within the smallest possible space. Therefore, it had to made from titanium: in addition to its appreciable lightness, the properties of this low-density metal ensure the best possible sound diffusion. The circular-section gongs directly affixed to the case are individually fashioned and finished by hand throughout the production process, which involves many separate stages, as are the two hammers. The pusher activating the striking mechanism is positioned on the case middle at 9 o’clock. It is designed to guarantee continuous water resistance to 50 m.
The in-house developed and produced BVL Calibre 362 measures just 3.12 mm thick and the overall case thickness amounts to only 6.85 mm. It is hand-wound and delivers a 42-hour power reserve once fully wound. The hour-markers on the dial – made from titanium like the case – feature an incised, cut-out design, as too does the small seconds counter at 6 o’clock: the openings serve to amplify resonance inside the case and thereby optimise the sound effect. 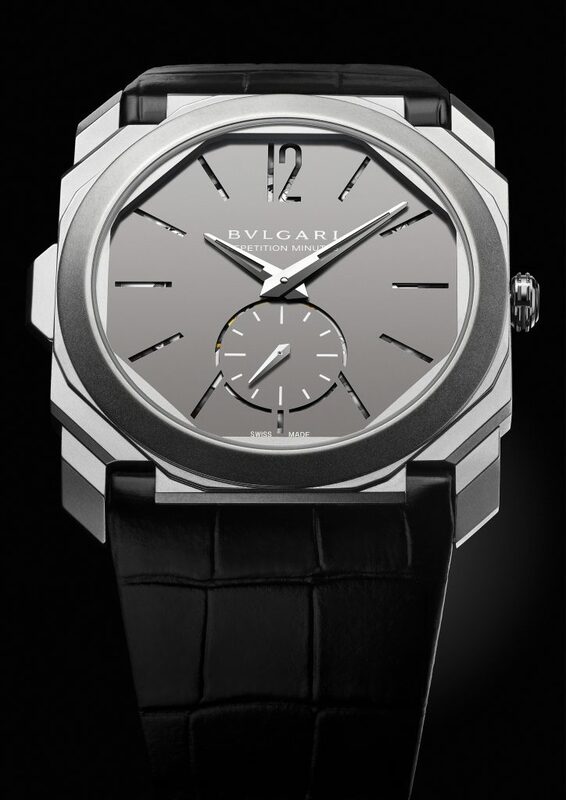 The Bulgari Octo Finissimo Minute Repeater embodies a paradigm shift in terms of slenderness and lays the foundations of a new approach to mechanics and to classic complications, all the while preserving and cultivating watchmaking traditions. This watch is a limited, 50-piece edition.